Lets be honest, it's not hard to make broth, but it is hard to make it taste good. 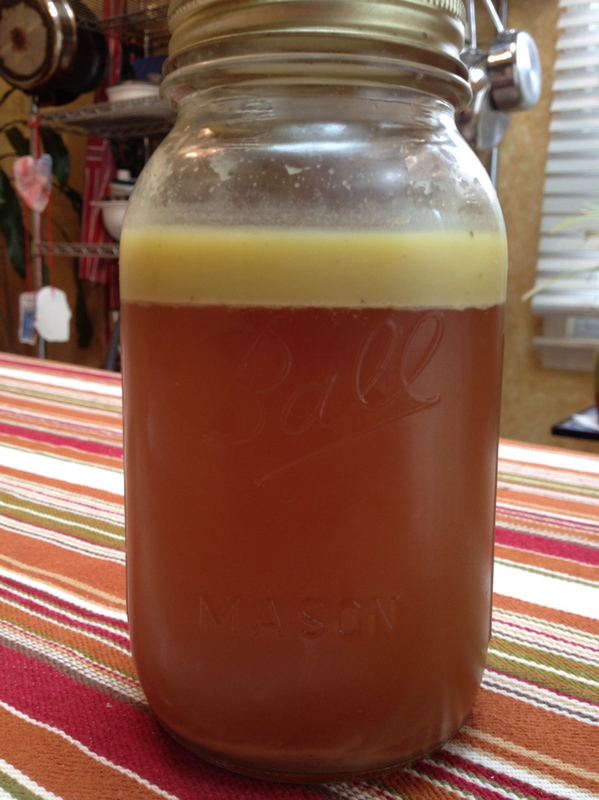 Now that I've got the bone broth recipe down, I had an idea which made the hamster wheel start turning. Why wouldn't I use the same method to make chicken broth? Duh. In the past I've always just thrown the carcass in a huge stock pot, covered it with water added some salt and pepper and boiled it to death for a few hours. Sound familiar? This time I dragged my frozen carcass and leftover legs out, threw them in the crock along with some veggies and herbs and let it simmer for about 30 hours. Wow. What an unbelievable difference. And the color was almost as dark and rich as the beef broth. What a fool I've been not to do this sooner. Throw all ingredients together in a crock pot. Cover with water. Cook on low for at least 24 hours. Once finished strain and pour into jars or containers and refrigerate or freeze. Again as with the beef broth, I salt to taste as needed for use. Don't forget to let the broth cool for a day in the fridge then remove the fat layer BEFORE freezing. You can see in the picture the fat that formed on top after a few days. Let it go until you need to open it. The fat keeps it 'sealed'. Another note worth mentioning. The night I made the roaster, I picked it pretty clean of chicken for leftovers and put it in a ziploc bag, including the onion, parsley and rosemary sprigs and garlic that was still in the cavity. I did remove the lemon since I tried making stock with the lemon before and I wasn't too thrilled with the taste. The carcass ended up in the freezer for a few days until I had time err, remembered that it was in there. I also had a few leftover chicken leg bones in the freezer from a different recipe, Nom Nom's Phenomenal Green Chicken. Why am I saving half eaten food? Because MDA pointed it out. If you're a stock maker, always save bones in the freezer until you have enough. So I am. I'm a good little recycler. (that was one of my New Year's non resolutions) Although, if someone has scurvy while eating said chicken parts, I would feed them to the trash can. If you have the time and leftover random chicken bones, I would definitely use this stock to make the Escarole soup. I would hate for the soup to turn out just OK because of tasteless store bought broth.